Lummus and Rope Myers, a perennial finals qualifier who barely made this year’s field, tie for first place with runs of 3.5 seconds. The victory extends Lummus’ lead in the world standings over No. 2 Bryan Fields to $4,100. Myers moves from No. 11 to No. 6. Andrus and Lummus post runs of 3.5 seconds to tie for first place in the round, shaking up the world standings. Lummus remains No. 1 $14,500 ahead of No. 2 Andrus, who has vaulted past Fields, who has dropped to No. 4. Who’s No. 3? Myers, who has placed in all three rounds so far,a nd now trails Lummus by about $24,500. Myers continues his amazing climb up the steer wrestling rankings by finishing in the three-way tie for first place with his younger brother Cash and Chad Bisemeyer with runs of 3.6 seconds. The finish moves Rope Myers to No. 2 in the world standings, less than $14,000 behind Lummus. Myers continues to put the heat on Lummus by winning the round with a run of 3.3 seconds. Lummus remains No. 1 – but not by much. His lead over Myers has shriveled to just more than $1,000 with five round to go. Adding to the plot, Myers and Lummus are 1 and 2, respectively, in the average race. Fields steals the spotlight, posting a run of 3.0 seconds to tie the existing finals mark set by Steve Duhon in 1986. Fields moves to No. 4 in the world standings. Neither Lummus or Myers finish in the money but remain 1 and 2 in the world standings, respectively. Myers still holds No. 1 in the average race. Cash Myers wins the round with a run of 3.2 seconds. Brother Rope is second and uses the big payday to vault past Lummus into No. 1 in the world standings. In a span of little more than three seconds, Rope Myers take a $9,5000 lead in the world championship race over Lummus and control of the Finals average race as well. The world chamionship race ends for all intents in this round when Lummus posts a no time. Rope Myers meanwhile finishes ina three-way tie for second to build a lead of more than $17,000 in the world standings. Equally important, Myers sits at first place in the average race with a lead of 12.5 seconds over his nearest rival – and it’s not Lummus who drops to 11th in the average standings. For the second time in three rounds Cash Myers and brother Rope finish 1-2, respectively, with runs of 3.2 and 3.5 seconds. Rope’s lead in the world standings jumps to more than $27,000 over Lummus. Cash moves to No. 3 in the world standings. Jason Lahr wins the round in 3.7 seconds, but the big one is Rope Myers’ 4.0 second run. It ties him for third in the run and locks up his first world steer wrestling title. Myers proves the greatest steer wrestling season in PRCA history. 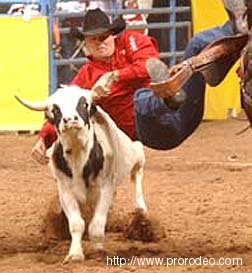 He sets steer wrestling records for average time at the Wrangler NFR (37.40 seconds on 10 head. Wrangler NFR earnings $117,774 and season earnings of $176,584).